Thanks for rocking and locking with Me, The Loc Doctress, and Macon Styles Team throughout another demanding Holiday season. We were ready and prepared this time around. We overcame challenges but had many successes. One of many challenges for myself was being newly introduced to the realest hood of all.... "Motherhood"! As a first time mom, I learned the power of saying "No I can't book you for that appointment" or "Sorry I must cancel, something came up" without feeling guilty. I realized that I had to put my growing child first. Many times I did not give explanation as to why I was vague in my communications. Simply because I am very private and like to keep my personal life separate from business! It's so real, I didn't even post about my pregnancy on my business page, so people who see me now are shocked that I was even pregnant (LOL). Even typing this blog has me on edge, but I told myself for 2018 I would connect more on a personal level with my locstars! I do extend sincere apologies to those who may have been inconvenienced as a result of sudden emergencies. Although these challenges were present and I had no manual on how to be a mom, wife and entrepreneur- all while getting in 8 glasses of water daily and maintaining self-love. I admit it wasn't as scary as I thought it would be. Especially now that my daughter is 8 months young and is becoming more in tuned with her independence. Most times I am working on a client while baby-wearing. She breastfeeds and sleeps most the time. Other times you may get a peek of her and a smile or giggle. Then you may find her in her playpen to the side listening to her educational videos. She's a vegan baby, so she enjoys her veggies and fruits. Because my work days average no more than 6 hours typically, it's a breeze handling her while working with my Partner Loctician assistant. Clients are extremely happy that they don't have to spend 12+ hours sitting in the chair. I'm actually happy to be back in the swing of things. I feel a sense of purpose with every loc Install. Coming back into the salon initially, I had a fear of being judged for working with my baby. I did not know how it would be perceived, but after a few clients being so open and accepting it really brought my guard down. I can't express how thankful I am for everyone who helped welcome me to this journey and supported me. Now it all just comes so natural. Hopefully one day we will be a mommy-daughter loctician team! 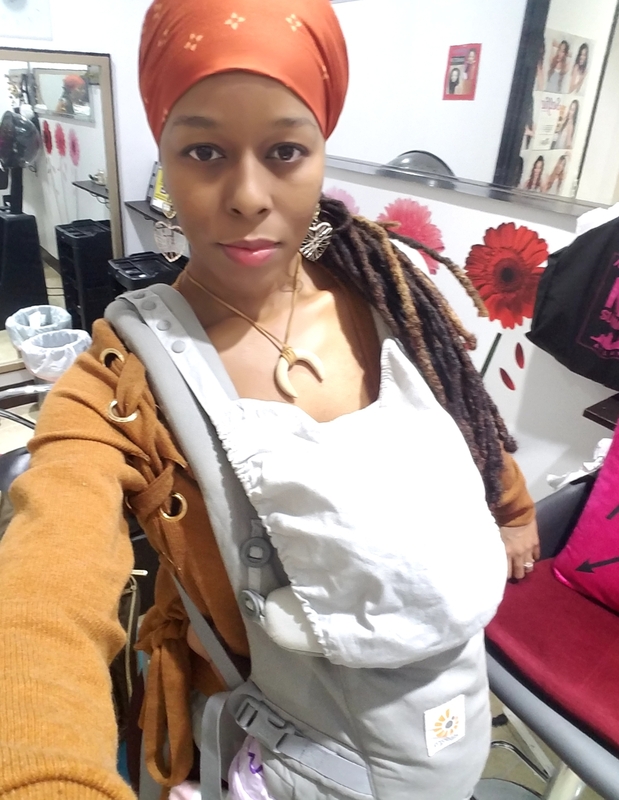 About my locs: In the midst of taking care of everyone else, I've found myself doing what Many stylists do-- Neglecting my own locs, just letting them go weeks without being properly nurtured, moisturized and sometimes washed. I really come down hard on myself about things like this because I can tell when I've been slacking. Now I am playing catch-up as I see some of my roots breaking off and some locks developing thin spots from not having proper nourishment. 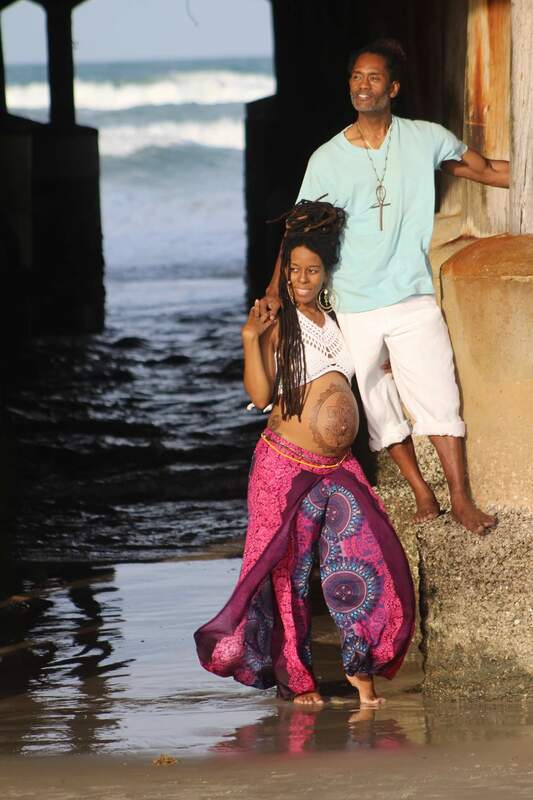 I also know that the pregnancy hormones resulted in some thinning and I am working on reversing that with the hair and scalp treatment growth system on the beauty shop tab. I will definitely be posting progress pictures. I'm trying not to be too hard on myself because I am eight years into my loc Journey so I see it as another Journey I'm taking with my locs that gives them even more meaning. Seeing clients who are embracing their locs with our Hairitage loc bundles truly inspires and motivates me although that may sound weird coming from someone who has naturally grown locs. They remind me of that excitement and Spark I had when I first started my journey and it makes me to remember to always cherish the process.